Steve Spaneas doesn't have a clue. Who'd have thought that the woman who stumbles her way into his gym, looking and acting so very much like a street person off her meds, is really a CIA case officer whose memory has been obliterated by experimental drugs used by some very bad people? And seriously, who'd have thought that her attempts to untangle the few clues she's got would lead him right into her world of spies and counterspies, death and deception--and holy cow, stockpiled nuclear weapons? But Steve had better figure out who he trusts--his years of experience on the streets, or the heart of a gritty woman determined to reclaim herself--and he'd better figure it out fast. Because suddenly there's a body out behind the gym, surveillance teams lurking, and a series of unsavory goons following the trail of a woman temporarily named Mickey right through his life. Clever, strong, high-action heroines--a taste of Alias, Buffy, Xena, and Covert Affairs, including heroes who are strong enough to capture these wild hearts. HIDDEN STEEL: Steve Spaneas doesn't have a clue. Who'd have thought that the woman who stumbles into his gym, looking and acting so very much like a street person off her meds, is really a CIA case officer whose memory has been obliterated with experimental drugs wielded by some very bad people? MAKING THE RULES: Framed, cut off from the agency, and tangled in Basque Nationalist splinter terrorist groups, the biggest challenge Kimmer and Rio face is coming to terms with their pasts and with each other--so they can live through the day on the way to saving it. "HIDDEN STEEL is an engaging thriller that grips the audience from the moment [Mickey] wakes up and never slows down.... Mickey is terrific..."
"HIDDEN STEEL is a page-turner voyage of discovery, with the fate of the free world in the balance. Well-drawn characters, numerous plot twists, and unexpected glints of humor are what I've come to anticipate in any of Doranna's novels, and this one definitely lived up to expectation!" 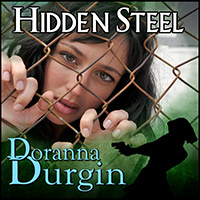 "Readers who remember Ms. Durgin’s Bombshell releases will be thrilled with HIDDEN STEEL... a strong heroine, a great hero and a story that keeps you completely enthralled.... HIDDEN STEEL has mystery, action, a little romance and loads of great characters." "HIDDEN STEEL is a pulse-pounding suspense...Full of mystery and interesting characters, HIDDEN STEEL will grab readers from the beginning and is a book you don't want to miss."